Guest Post: translating the Great War…. 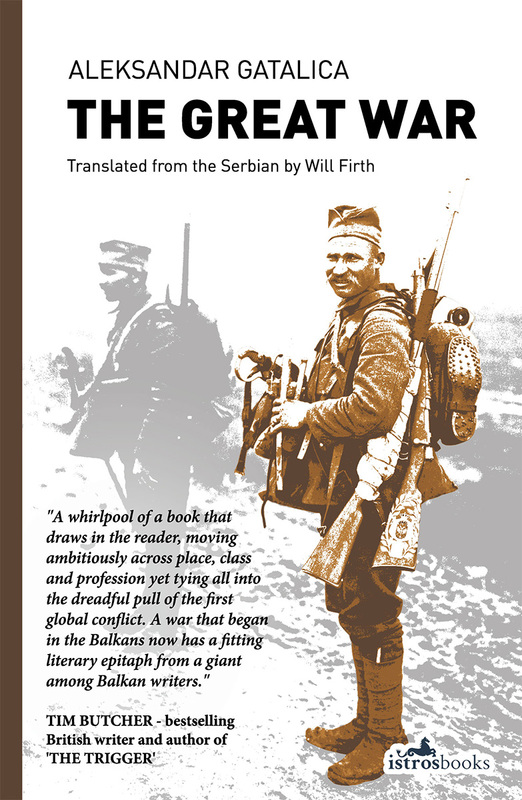 Will Firth, one of a handful of experienced literary translators from BCS (Bosnian/Croatian/Serbian) opens the window on his present project – a translation of one of Serbia’s best-selling books in recent years – The Great War by Aleksandar Gatalica. ”I feel almost privileged to be translating The Great War (Veliki rat) by the Serbian writer Aleksandar Gatalica because it really is a most entertaining and moving book written with a convincing blend of styles and imagery. It is hardly surprising that it won the Serbian novel-of-the-year award (NIN nagrada) in 2012. Over seventy main characters come together in The Great War. Among the historical figures we meet are Manfred von Richthofen (aka The Red Baron), the flamboyant poet Guillaume Apollinaire, a megalomaniac little corporal in a Bavarian regiment on the Western Front (Adolf Hitler), and the illustrious Mata Hari – one of several spies in the book. These are joined by many characters who are fictional but convincingly portrayed: a Sarajevo pathologist who finds Archduke Franz Ferdinand and Duchess Sophie on his dissection table in 1914; a failed German artist who is now a zeppelin pilot itching to drop a bomb on Picasso; and an Istanbul spice trader, whose five apprentices are all mobilised and sent to five different frontiers across the unsettled, post-Ottoman territory of Turkey. This is a skilful device which helps sketch the geopolitical dimensions of the war. Many readers will not know that the relatively young Kingdom of Serbia was wiped off the map during WWI. One of the characters is a Serbian commander who repeatedly lies to his freezing, starving men to give them hope and keep them alive on their long retreat through the mountains of Albania; ultimately they reach the Adriatic coast and the relative safety of Corfu, where the officer indulges in a single glass of ouzo – and dies. The Great War has many elements of a historical novel but is also rooted in the tradition of magic realism. A German submarine captain, for example, is in league with sea monsters; a Turkish policeman of Armenian extraction (something he has successfully repressed) is finally overwhelmed by the spirits of all the Armenians killed in the genocide; a Russian surgeon on the Eastern Front miraculously saves soldiers with bullets in their brains, and the often illiterate muzhiks wake up speaking German; at the same time, students and poets in the Austro-Hungarian army are dying after bloody battles in Serbia, despite the best efforts of a surgeon there (our Sarajevo pathologist). Their souls ‘migrated east (…) along some imponderable transversal, in the invisible barques of the dead, into the split heads of Russian farmworkers’. The Austrian Bolshevik Karl Radek sets off from Zürich, Switzerland, for Russia in March 1917. He is one of the passengers in Lenin’s famous sealed train. On the long journey through war-impoverished Germany, Radek sees the same boy at every railway station: a fair-haired lad with a freckled nose, whom he instantly feels fond of. Pale and emaciated, the boy is either pushing a heavy luggage cart, waiting despondently or leaning on a crutch. And when Radek arrives in troubled Petrograd he can’t believe his eyes: the same boy, it seems, has been sent to meet him. As well as being fascinating ideas in themselves, these events and links create a web of intersecting fates. The Great War portrays the cataclysm that was WWI from a pan-European perspective and will hopefully help redress Anglophone preoccupation with the Western Front. The author paints a convincing, gripping picture of a continent in agony. It is the end of an age built on a belief in material and technical progress, and the beginning of an uncertain future.